Girls Varsity Basketball · Feb 8 Wooster beats Ashland to sweep the OCC again! Wooster celebrated its second undefeated OCC season, putting up big numbers against Ashland, 79 to 47. 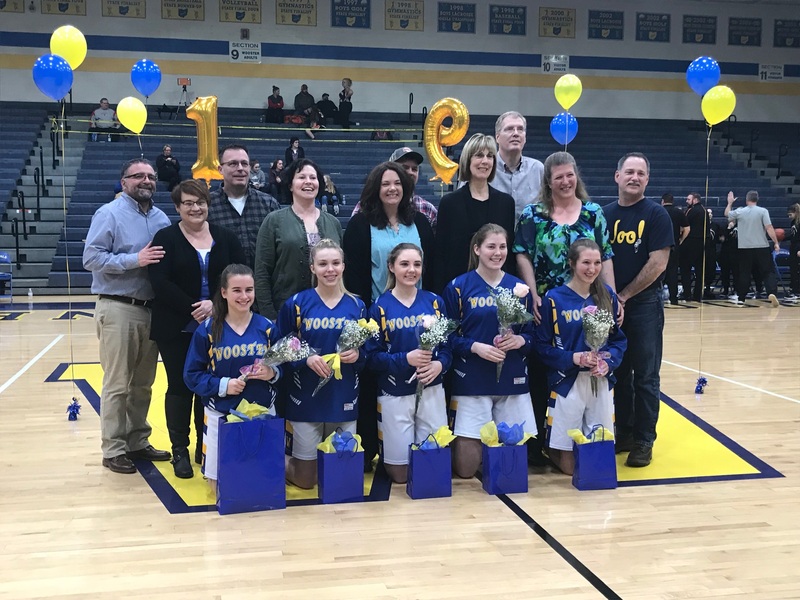 Seniors Sydney Clapp and Stephanie Smith made it a senior night to remember! Clapp had 22 points including six 3-pointers plus 7 assists, 4 rebounds and 3 blocks. Smith posted ANOTHER double-double with 21 points and 14 rebounds plus 3 blocks. Junior Daisha Brown also had a double-double scoring 14 points and caroming 12 rebounds. Her classmate Izzy Signorino dropped another 8 points. Scoring the rest of the buckets were senior Emma Anderson and junior Anna Cichello with 4 a piece, and with 2 points each, seniors Gina Van Lieu and Anna Zerrer, and freshman Ravin Morgan. JV softball tomorrow, April 17 at Cloverleaf has been canceled.